It is impossible to get anything made or accomplished without stepping on some toes; enemies are inevitable when one is a doer. But the strong lights placed on either side of my face made my blue eyes look almost white and by nearly eliminating my nose made me seem cross-eyed. I posed in dust-cap and house dress with a famous mop for dental paste and for soft drink holding my mouth in a whistling pose until it all but froze that way. 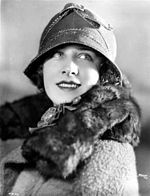 There were many other talented actresses at the studio and Norma Shearer realized Norma Shearer would have to fight hard to stay ahead of the pack. Shearer's legacy began to be re-evaluated in the 1990s with the publication of two biographies and the TCM and VHS release of her films many of them unseen since the implementation of the Production Code some sixty years before. Edith Norma Shearer (August 10 1902 – June 12 1983) was a Canadian-American actress. Unlike many of her MGM contemporaries Shearer's fame declined steeply after retirement.